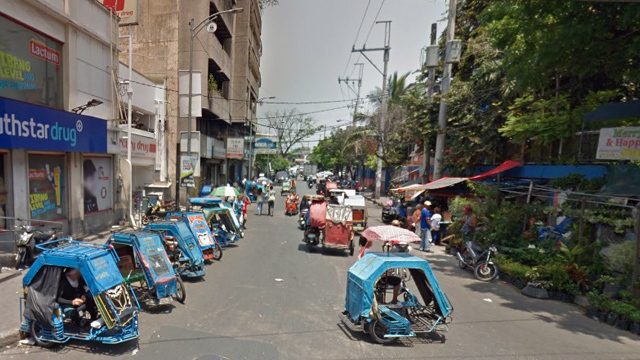 Spot.ph is your one-stop urban lifestyle guide to the best of Manila. Completing your profile entitles you to the latest updates, invitations to special events, and cool downloadable freebies! Follow the steps below to reset your password. Enter and confirm your new password. What would you like to do today? The university president also issued an apology. 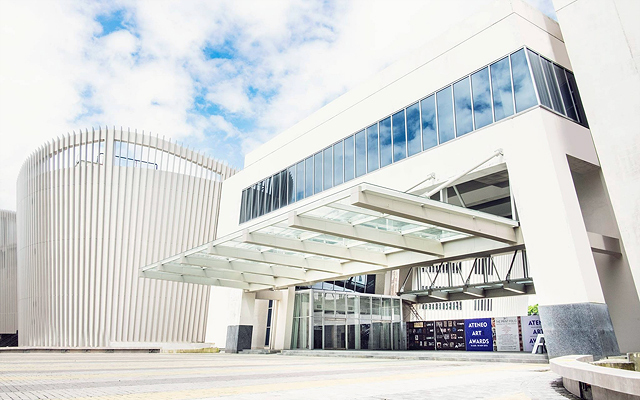 (SPOT.ph) After Areté, Ateneo de Manila University's colossal arts and innovation hub, opened its doors to the public in 2017, it was applauded for staging back-to-back plays about the atrocities of the Martial Law period and highlighting the underground art movement during the Marcos regime. 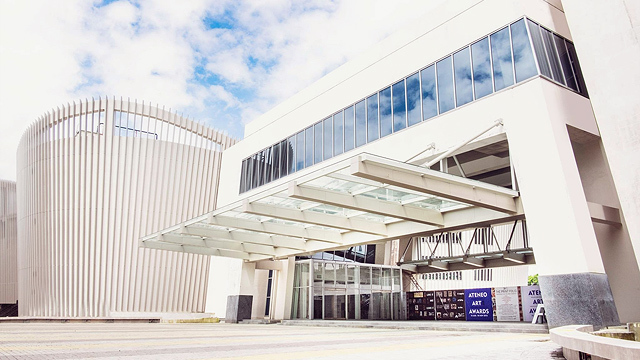 So Irene Marcos-Araneta's presence on April 7 at the opening of the arts center's Ignacio B. Gimenez Outdoor Installation Grant Program inevitably caused an uproar. On April 10, University President Fr. Jose Ramon T. Villarin, SJ released a statement saying that Yael Buencamino—executive director of Areté—has "voluntarily offered to resign" from her post. "The University recognizes that her presence, even in a personal capacity, has cast doubts regarding its solidarity with the victims of the Martial Law regime," started Fr. Villarin. 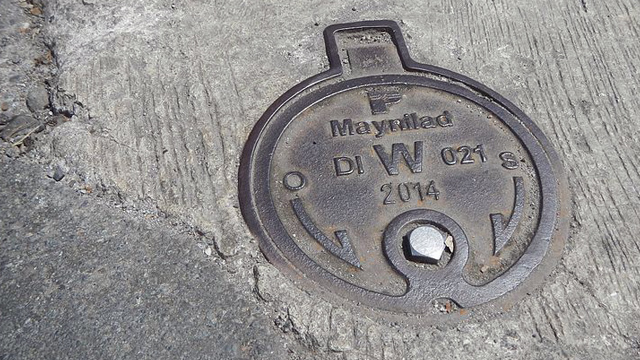 "We offer our deepest apologies for the hurt that this has brought. The unintended consequences of this incident do not mean that the University has turned a blind eye to the atrocities committed during the Martial Law regime," it continued. "I call on the University community to hold fast to our commitment to justice and peace, and to help one another remain vigilant, especially during this time of forgetfulness," Ateneo's president concluded. 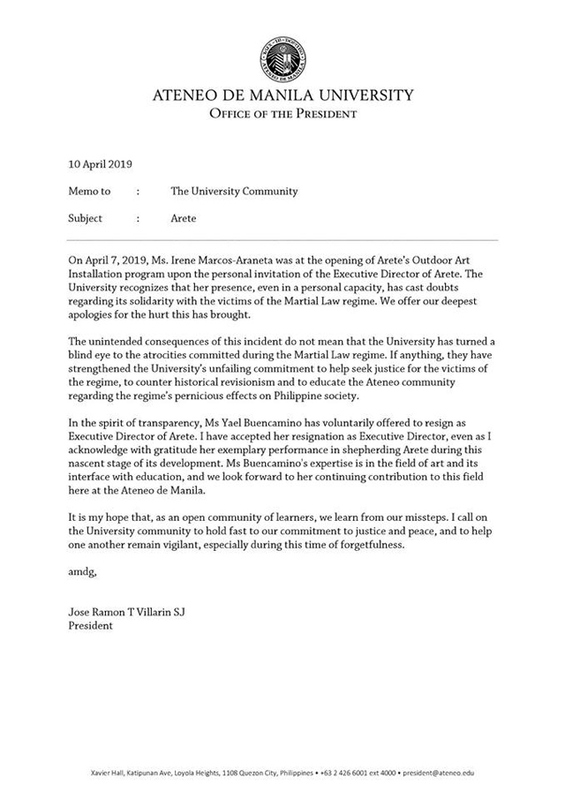 Ateneo's student council, the Sanggunian ng mga Paaralang Loyola ng Ateneo de Manila, on April 8 released an indignation statement expressing dismay at the presence of Irene Marcos at an official university function. "It is nothing but ironic that a Marcos participated in the event of the institution, Ateneo's premier creative hub where the spirit of creativity and innovation is nurtured and cultivated. It is the university's central space for creative, adaptive, and independent thinking—values that the Marcoses systematically destroyed during the darkest era in Philippine history," the student body representative pointed out. 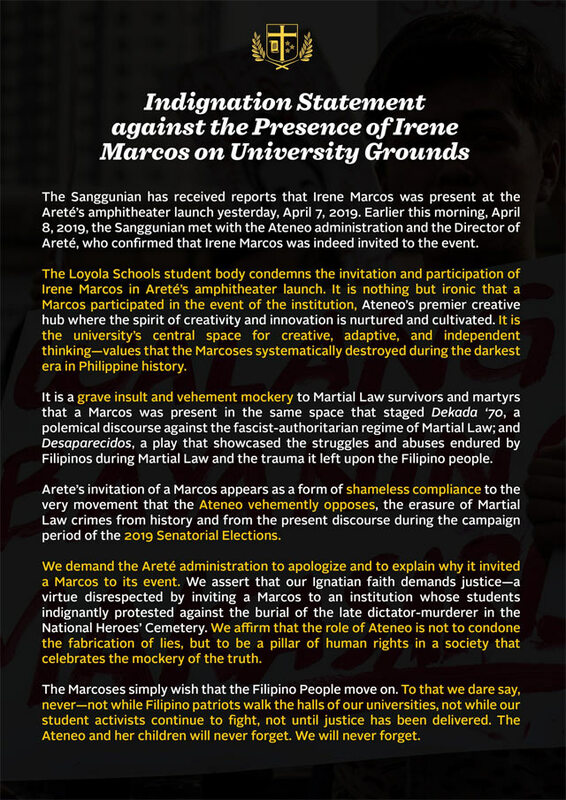 It also called out Areté for this "grave insult and vehement mockery to Martial Law survivors and martyrs" and that the invitation is a "form of shameless compliance to the very movement that the Ateneo vehemently opposes, the erasure of Martial Law crimes from history and from the present discourse during the campaign period of the 2019 Senatorial Elections." Ilocos Norte Gov. Imee Marcos, senatorial candidate and sister of Irene Marcos, dodged questions about the incident. "No comment," she hesitantly answered during a press conference on April 10. Irene Marcos, a long-time patron of the arts, attended the event "upon the personal invitation of the Executive Director of Areté." Buencamino is the granddaughter of Luis Ma. Araneta, also an art patron. He was the father of Gregorio Ma. "Greggy" Araneta—spouse of Irene Marcos. Areté has previously hosted two theater groups that adapted and staged Lualhati Bautista’s most celebrated novels, Desaparesidos and Dekada '70. The first, which was adapted by Guelan Varela-Luarca, served as a reminder of the senseless deaths, unimaginable torture, and enforced disappearances of Filipinos at the hands of Marcos; while the latter, which was turned into a musical by Pat Valera, tells the story of how a middle-class family chose not to turn a blind eye to what was happening in the country during that time. The plays were among the best shows we saw in 2018.